In a large bowl, combine all dry ingredients (flours, oats, flax meal, wheat germ, baking powder, sugar and salt). In a separate bowl, mix together the eggs, milk, applesauce, oil and vanilla. 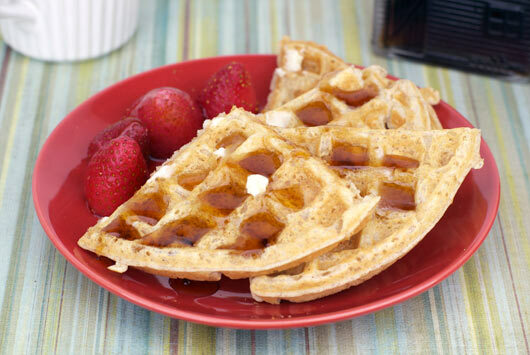 Cook waffles in a lightly-greased preheated waffle iron according to manufacturers instructions. Serve with pure maple syrup. Enjoy! Healthy and yummy with whole wheat flour, oats, flax and wheat germ. The only waffle recipe I use anymore! Recipe number 1924. Submitted 12/9/2006.